Michael Zhao (Yunfeng) received a Master's in Journalism from UC Berkeley in 2007, after working for Pulitzer Prize winning team of Joe Kahn and Jim Yardley out of Beijing Bureau of The New York Times. His latest multimedia works at CHINA GREEN earned him prestigious awards. While at Berkeley he shifted his focus from print to multimedia journalism and completed an interactive thesis about electronic waste. His mini documentaryeDump has been featured in numerous film festivals around the world. He has published numerous articles and photos in the New York Times, Forbes, The Economist, Far Eastern Economic Review,Berkeley Science Review, World Policy Journal and other publications. As Managing Editor/Producer of CHINA GREEN with Asia Society Center on US-China Relations (2007~present), he runs and produces video and new media packages on China's environment, energy and climate issues. The trailer is a short journey throughout China with a few animal welfare grass roots organizers who have devoted their passion, time and financial resources to help rescue pets and other animals. Given the recent dog culls, pet abuse and other brutal acts against animals in China, these individuals and organizations are not only making a huge sacrifice out of their own careers, if any, but also running against a lot of resistance and sometimes animosity by some people in the society. 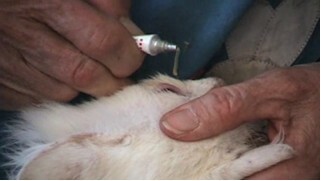 Their lives, and work with animals they have saved and are helping, are a constant struggle, financially and mentally. The trailer presents some snippets of these lives and how they fight for the welfare of the little lives they are struggling every day to protect. HOW DID MICHAEL BECOME INVOLVED WITH ANIMALS IN CHINA? 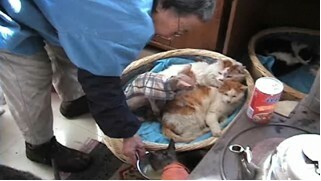 "I have come across this subject after hearing about Grandma Ding in a Beijing courtyard house where she has saved hundreds of stray cats, or previously stray ones. She still keeps more than a hundred, mostly surviving ones. Her work has touched many people's hearts and earned her quite a fame in Beijing. Slowly I ran into other people who are doing similar things to help cats and dogs in different cities in China. In the meantime, news broke out here and there about cruel animal abuse cases throughout China as well. As I traveled around the country learning abut what different people and organizations are doing, it's been always a hope that with a film that I eventually put together, this project can tell a story about a China where people are getting rich and starting to have lots of pets but at the same time there's a increasing clash between human needs and animal rights. When people mistreat animals nowadays, many Chinese stand up to speak for these animals. The Chinese society is progressing, but at the same time there's still not a law that protects animal rights, and many believe there won't be one any time soon. I hope this film can raise more awareness of the living environment pets and other animals are dealing with in China and hopefully this will push some more and faster progress of animal welfare in China."